Deciding to spend the entire day hiking at Wissahickon Creek, somehow nuzzled beautifully right in the outskirts of Center City Philadelphia, was the easiest decision of the day. 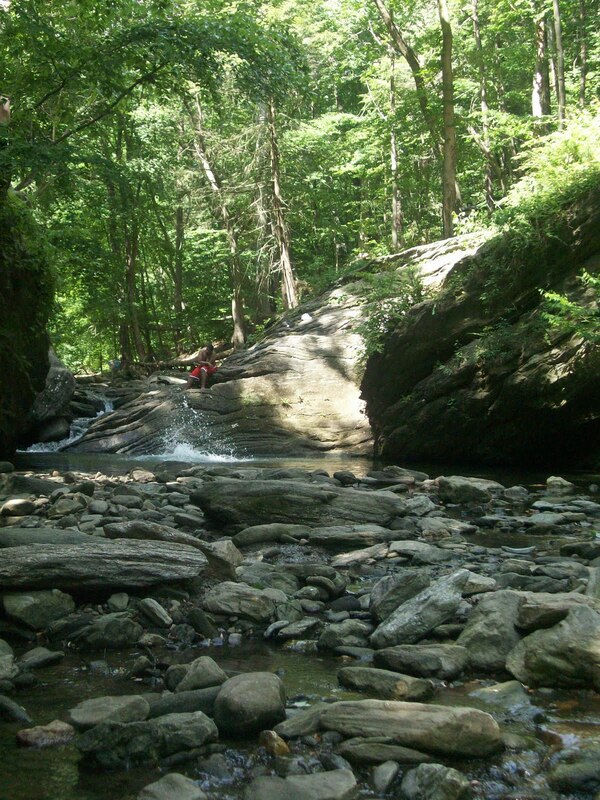 The hardest part of the day was when I was forced to decide whether or not my companion, Marley, a blind 9-year old Pitbull/Boxer mix, could make it up the slippery shale rock en route to Devil’s Pool, a deep swimming hole surrounded by cliffs. What we accomplished breathed new life into our afternoon excursion. 1. The payoff will always trump your initial doubt. Marley and I were rather tired after hiking up and down Forbidden Drive along the Wissahickon Creek for about 2 hours. Faced with the decision to soldier on or call it a day, I almost pulled the plug early to head home. I thought to myself, “Why come all this way if you haven’t even found what you’re looking for?” Eventually we did find the swim hole called Devil’s Pool which was the whole reason for the trip. Any doubts I had about continuing on and finding the swim hole deep in the woods were squashed once we arrived. 2. You are probably going to meet some cool people. Around Devil’s Pool I was greeted by a friendly tourist who wanted his photo taken. I did, and he took mine in exchange. We chatted briefly, and then I moved on to talk to a couple of kids who were picnicking on the rocks nearby. They were fun and full of information on the swim hole. Apparently it’s safe to dive off the nearby cliffs because the water is about 10 feet deep. From a distance, I never would have thought that to be possible. But I stand corrected: moments later, kids were jumping off the cliff, one after another, like brave lemmings. Not to mention when I was leaving, a couple of guys offered me a beer and some conversation. They suggested I stay and hang out, and I did for a while. These are friends I met in the middle of the woods! That’s to say, if you get out there and take a chance and strike up a conversation, you’re likely to be welcomed and treated warmly. 3. You’re going to see some great things. My day could have taken the inevitable turn for the same. I may have cruised around the city, scouring for something to do, maybe buy a cup of coffee and read the paper. More than likely, though, I probably would have spent too much time at home, online, doing mostly nothing. But, I decided to get out of the house and GO. Sometimes that’s all you need to do to have the great day you never expected. Isn’t that wonderful? 4. You will always have a story to tell. Imagine your frustration when faced with a situation of story exchanging, maybe when catching up with an old friend, you discover you don’t have much to say. There’s only so far the question “So what’s new?” the answer “Not much” is going to get you. Do you want to subscribe your world to the sentiment of Not Much? Me neither. So then, get out there and go! 5. Prove to yourself that you dare to be different. Sounds a little cliche, but think about it. Do find comfort in taking the same vacation every year? Following the same routine day in and day out? A wise friend told me that stability is what we crave but it also makes us feel trapped. While you must adhere to a lot of consistency in life, whether it be work, your relationships or maintaining your home, there is ALWAYS wiggle room. Try spending a day off doing something you normally wouldn’t. Decide that what you have done today isn’t enough and forge on. You won’t regret it if you do. Next postOne Tequila, Two Tequila, Three Tequila…. This is my kind of place!!! I looove diving into pools of water! I also love talking to people. While I'm out here in St. Louis, I am always itching to get away from the 20 people I spend every single day with. So I walk around, get on the bus, try to find new places, and it's so fun to talk to strangers! Hooray! !